Welcome to the Inn at Crystal Beach! Vacation Rentals Inn at Crystal Beach is located on Scenic Gulf West in Destin Florida. This gorgeous condominium is situated right on the Gulf of Mexico, it's a luxury condominium featuring upscale two- to seven- bedroom condos. They are all beautifully decorated and are equipped with kitchens, and have breathtaking views of the most beautiful white-sand beaches in Florida. 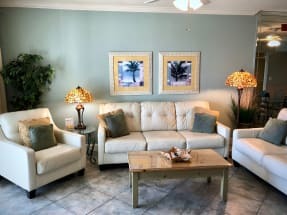 At the Inn at Crystal Beach you have the option of enjoying a state of the art fitness studio, business center with a fax and copier, Gulf-front pool, hot tub, and a large sundeck! While you're on your stay, you'll have many choices of shopping and entertainment sites. One of the most popular shopping centers is Destin Commons! There you will find as many shops as you can think of and even many different restaurants to choose from! One day, take a break from going to the beach and take the whole family to the Big Kahuna water park for some family fun on water slides and even in the wave pool. Another popular place to take the family would be the the HarborWalk Village! There the family can rent a boat and head on out to crab island for the day, or stay back and go fishing, rock climbing or parasailing. The possibilities for a good time are endless in this wonder part of Destin! Thank you for visiting Emerald Coast By Owner for all your vacation needs! Make sure to contact the property owner today if you are interested in staying in the Crystal Shores condominiums! Booking direct with the property owner allows you to get answers to your questions before you book and assures you are not over paying for your rental property. ECBYO does not charge any service fees when you book with us, so book online today and save!